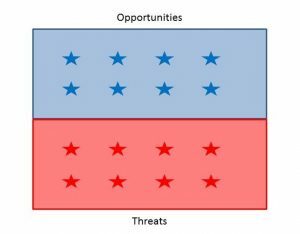 Why are there never as many opportunities as risks? | DEW Risk Ltd.
We are always encouraged to consider opportunities as well as threats (risks* ) in project risk management. However, whatever the project, there are always many risks to consider and manage but only a few small opportunities. Why is this? Consider a plane with opportunities at the top and threats at the bottom. Call it ‘project space’. In the status quo there are as many opportunities out there as there are threats. 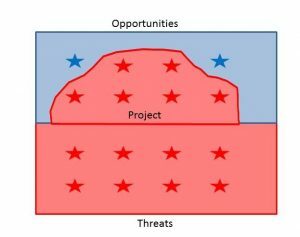 When we set up a project to take advantage of these opportunities we move the boundary between threats and opportunities deep into the opportunity side of project space. 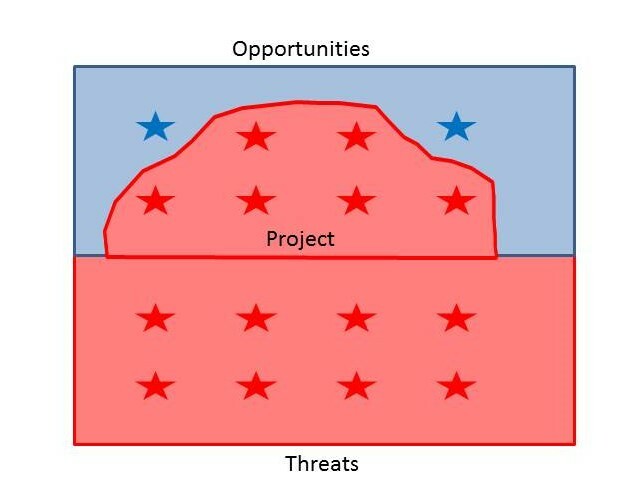 In summary most opportunities will be claimed as benefits by the project when it is set up leaving the threat that these benefits may not be realised. * Risk management encompasses threats and opportunities. However colloquially, threats and risks are synonyms.